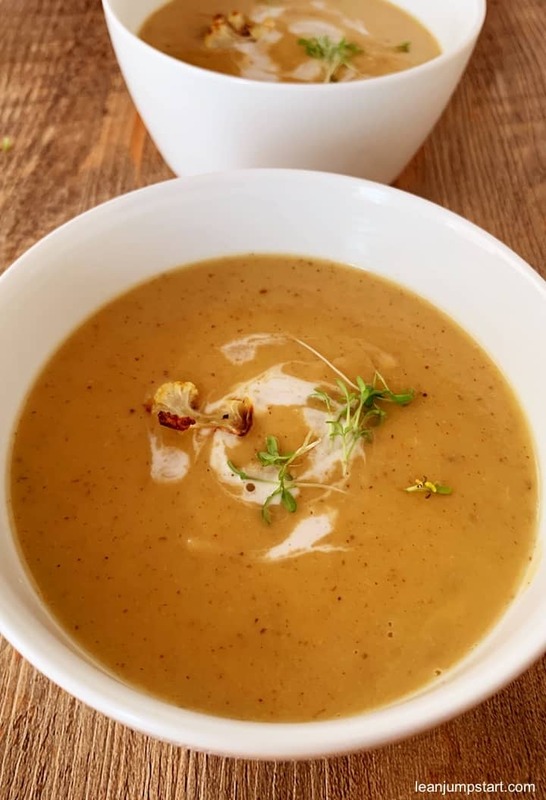 I’ve named my recipe roasted cauliflower soup, but of course I don’t mean that the soup is roasted, but the cauliflower. This is the most important part of this easy soup recipe. 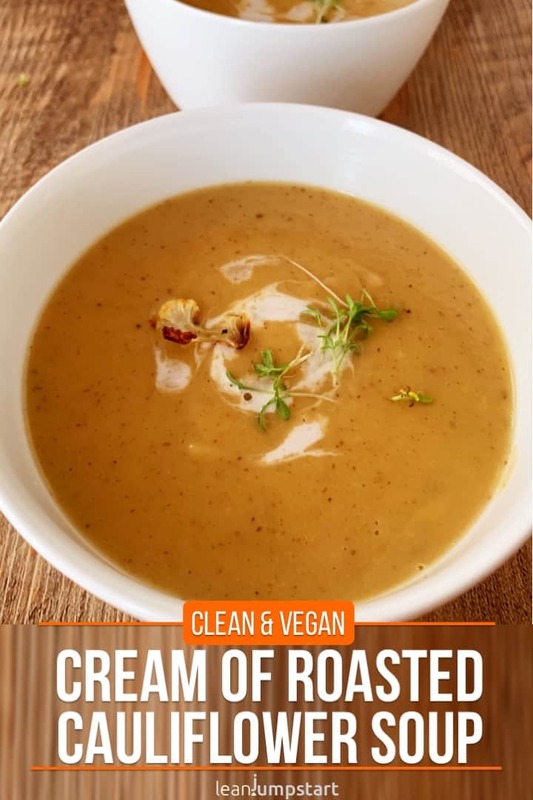 This vegan dish is full of natural flavors that come together in a creamy and very easy to cook cruciferous vegetable soup. When you roast the cauliflower, its nutty flavor unfolds its full potential. In order to get a deep aroma, you should not miss this important step. I have also used a flavorful spice mixture of thyme, nutmeg and cayenne pepper for this delicious soul food. This great recipe lasts for 3 – 4 portions. You can also eat some salad as starter or pair the soup with slices of whole grain bread. And when I say low-calorie, I mean 236 calories for a large plate of cauliflower soup. But I only managed one full bowl, because the soup is really rich and satisfies very well. 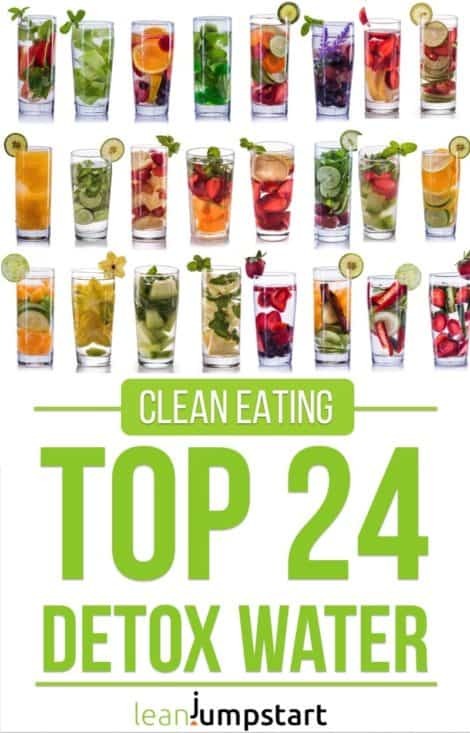 If you are anyone who counts calories and still want to get full then you have found the solution. If you’re not a big cauliflower fan, try it roasted. I’ve seen people adding parmesan cheese but you really don’t need it. Oven roasting alone turns the white vegetables into an incredibly delicious food. Because the edges caramelize with a little salt and the cauliflower tastes sensationally awesome. To turn the soup into a creamy delicacy you have to just purée the ingredients in a blender or food processor. Done! By the way, the soup is not only vegan but also gluten-free. The following recipe is sufficient for 3 – 4 portions, but you can easily double it. Preheat oven to 425 F°/220 °C. Line a baking tray with parchment paper. In a large bowl, toss cauliflower florets, garlic cloves, oil, salt and pepper until evenly coated. Spread out into a single layer on the baking sheet. Roast at 425 F°/220 °C for 30 minutes, until cauliflower is tender and golden brown. Stir it once half way through roasting then spread back into an even layer. Heat the oil in a soup pot over medium heat. Add onions and sautée for 2 minutes. Slowly whisk in vegetable broth, nutmeg, thyme, and cayenne pepper. Add cauliflower and garlic and bring to a boil, stirring constantly, then reduce to a simmer until thickened (for approx. 5 minutes). Add plant cream and puree in a food processor or an immersion blender. Pour creamy soup back into pot. Garnish with some garden cress and/or tiny bits of roasted cauli. For a thinner soup, stir in additional vegetable broth to reach desired consistency. Create a cauliflower potato soup by using cooked potato cubes instead of cream. To give the whole thing a Moroccan touch, you can also use a spice mixture of cumin, coriander, turmeric, ginger and cinnamon. Last year I published a mouth-watering cauliflower salad which is also based on roasted veggies. It is a very common side dish in the Middle Eastern kitchen. Click through for my creamy roasted cauliflower salad. Yes, for me too, it’s one of my favorite soup dishes in the cooler season. I love soup at this time of year and this sounds stunning! Roasted cauliflower has so much flavour! Thank you for your kind words Cliona. In the colder season, I could eat a filling soup every day. 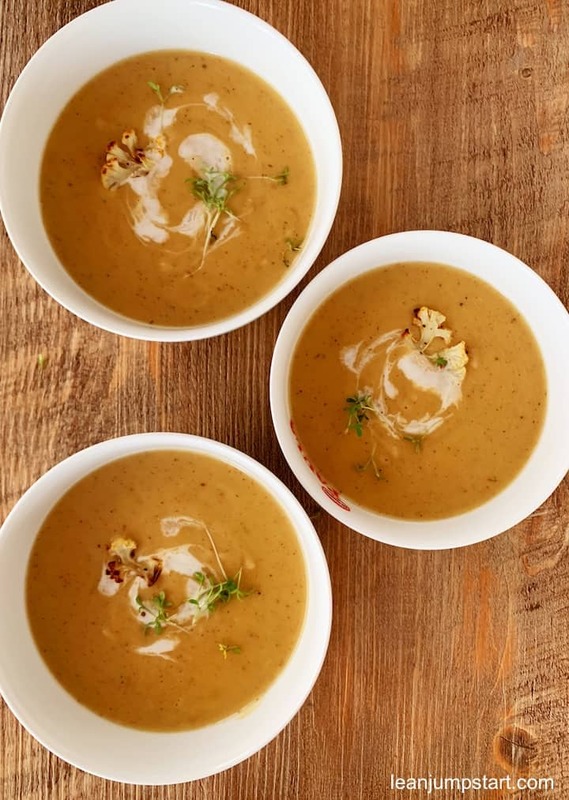 We love roasted cauliflower soup. It’s such a great budget friendly winter meal. Often the best soups are those with a few affordable ingredients that let the main vegetable shine in its full glory. Love the flavor here – the caramelized cauliflower must add so much flavor! I agree, roasting cauliflower makes for some great flavor. Your soup looks healthy and delicious!